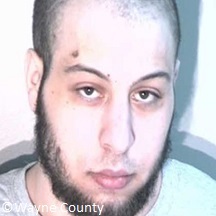 Khalil Abu-Rayyan is an American citizen who expressed support for ISIS and a desire to carry out a domestic terror attack on a church in Detroit. He was investigated by the FBI after making increasingly violent terror threats on Twitter.“United States of America v. Khalil Abu Rayyan,” United States District Court for the Eastern District of Michigan, February 4, 2016, https://media.clickondetroit.com/document_dev/2016/02/05/SKM_C554e16020515520_2078266_ver1.0.pdf. Rayyan was arrested on an unrelated charge of illegal firearm possession, and was sentenced to five years in prison on April 6, 2017. Rayyan was given a sentence greater than that recommended by federal guidelines for the charge due to his professed intentions to carry out a domestic terror attack.Orlandar Brand-Williams, “Accused ISIS supporter gets 5 years on firearm charges,” Detroit News, April 6, 2017, http://www.detroitnews.com/story/news/local/wayne-county/2017/04/06/accused-isis-supporter-sentenced/100135862/. Rayyan, who was born to Jordanian immigrants living in Dearborn Heights, Michigan, worked as a pizza delivery man.Lisa Rose, “How a suicidal pizza man found himself ensnared in an FBI terror sting,” CNN, November 29, 2017, https://www.cnn.com/2017/11/29/politics/aby-rayyan-fbi-terror-sting-pizza-man/index.html; Niraj Warikoo, “Dearborn Heights man accused of supporting ISIS sentenced to 5 years,” Detroit Free Press, April 6, 2017, https://www.freep.com/story/news/local/michigan/detroit/2017/04/06/khalil-abu-rayyan-isis/100090964/. He was active on social media and starting in November 2014, began to retweet, like, and comment on ISIS propaganda material on his Twitter account, @khalilray21. The propaganda included news of ISIS victories and violent execution videos. Rayyan also posted a photo in which he was holding a pistol and making a gesture that signaled his support for ISIS. The FBI began to investigate Rayyan beginning in May 2015 due to increasingly violent threats that he was making about committing terrorist attacks in the name of ISIS.“United States of America v. Khalil Abu Rayyan,” United States District Court for the Eastern District of Michigan, February 4, 2016, https://media.clickondetroit.com/document_dev/2016/02/05/SKM_C554e16020515520_2078266_ver1.0.pdf. For example, he reportedly stated that he wanted to skin victims “like sheep.”Ed White, The Associated Press, “Khalil Abu Rayyan, Michigan Convict, Said He Wanted To Skin Victims ‘Like Sheep,’” Huffington Post, April 7, 2017, http://www.huffingtonpost.ca/2017/04/07/khalil-abu-rayyan_n_15861684.html. In November, he began used the Twitter account @khalilabura21, and tweeted a photo of himself with a weapon at a firing range with the caption “sawat hunting”––sawat being a term for Iraqis who oppose ISIS.“United States of America v. Khalil Abu Rayyan,” United States District Court for the Eastern District of Michigan, February 4, 2016, https://media.clickondetroit.com/document_dev/2016/02/05/SKM_C554e16020515520_2078266_ver1.0.pdf. Additionally, Rayyan also allegedly listened to extremist clerics such as Ahmad Jibril of Dearborn, Michigan, and al-Qaeda cleric Anwar al-Awlaki.Niraj Warikoo, “Dearborn Heights man accused of supporting ISIS sentenced to 5 years,” Detroit Free Press, April 6, 2017, http://www.freep.com/story/news/local/michigan/detroit/2017/04/06/khalil-abu-rayyan-isis/100090964/. That December, an undercover FBI operative made contact with Rayyan over social media. In their conversations, Rayyan expressed his support for ISIS and stated that he carried the same type of gun used by ISIS fighters. He also told the FBI agent that bought bullets and made plans to “shoot up” a large church close to his place of employment in Detroit, but that his father found his materials in his car and stopped him before he could carry out the attack. Rayyan stated that he had wanted to target a church because “it’s easy, and a lot of people go there…Plus it would make the news.” He stated that he regretted not carrying out the attack, and that he wanted to “do [his] jihad over here” if he could not wage jihad in the Middle East.“United States of America v. Khalil Abu Rayyan,” United States District Court for the Eastern District of Michigan, February 4, 2016, https://media.clickondetroit.com/document_dev/2016/02/05/SKM_C554e16020515520_2078266_ver1.0.pdf. When asked if he would kill women and children, Rayyan stated that “I would have killed every last one of them…I would have shown no mercy.” Ed White, The Associated Press, “Khalil Abu Rayyan, Michigan Convict, Said He Wanted To Skin Victims ‘Like Sheep,’” Huffington Post, April 7, 2017, http://www.huffingtonpost.ca/2017/04/07/khalil-abu-rayyan_n_15861684.html. Investigators identified a church that fit Rayyan’s description that could hold up to 6,000 individuals.“United States of America v. Khalil Abu Rayyan,” United States District Court for the Eastern District of Michigan, February 4, 2016, https://media.clickondetroit.com/document_dev/2016/02/05/SKM_C554e16020515520_2078266_ver1.0.pdf. In January, Rayyan also stated to the undercover FBI operative that he wanted to kill the officer who arrested in him October, who was presently in the hospital. Rayyan expressed a desire to carry out a domestic terror attack in the hospital that the officer was at. Rayyan also told the operative that he carried a knife or sword in his car and that it was his “dream” to behead someone.“United States of America v. Khalil Abu Rayyan,” United States District Court for the Eastern District of Michigan, February 4, 2016, https://media.clickondetroit.com/document_dev/2016/02/05/SKM_C554e16020515520_2078266_ver1.0.pdf. Rayyan purchased a pistol on October 5, 2015. Two days later, he was arrested for carrying a concealed weapon in an automobile and marijuana possession after he was stopped by a police officer for speeding, but was subsequently released on bail. He attempted to purchase another pistol after his release.“United States of America v. Khalil Abu Rayyan,” United States District Court for the Eastern District of Michigan, February 4, 2016, https://media.clickondetroit.com/document_dev/2016/02/05/SKM_C554e16020515520_2078266_ver1.0.pdf. He was also given similar charges by a state court the following month and pled guilty to both. In February 2016, he was sentenced to two years of probation by a state judge.“United States of America v. Khalil Abu Rayyan,” United States District Court for the Eastern District of Michigan, February 4, 2016, https://media.clickondetroit.com/document_dev/2016/02/05/SKM_C554e16020515520_2078266_ver1.0.pdf; “Dearborn Heights Resident Charged with Illegal Possession of Firearm,” U.S. Department of Justice, February 8, 2016, https://www.justice.gov/usao-edmi/pr/dearborn-heights-resident-charged-illegal-possession-firearm; “Accused ISIS sympathizer in Dearborn Heights sentenced for gun charge,” ClickOnDetroit, February 16, 2016, https://www.clickondetroit.com/news/dad-asks-judge-to-release-son-who-is-accused-of-church-plot_. Rayyan was arrested again by FBI agents on February 4, 2016, for being a marijuana user in possession of a firearm.“United States of America v. Khalil Abu Rayyan,” United States District Court for the Eastern District of Michigan, February 4, 2016, https://media.clickondetroit.com/document_dev/2016/02/05/SKM_C554e16020515520_2078266_ver1.0.pdf. He underwent federal trial the following year and was convicted and sentenced to five years in prison on April 6, 2017. The federal judge gave Rayyan a sentence greater than that recommended by federal guidelines for the charge due to Rayyan’s professed intentions to carry out a domestic terror attack.Orlandar Brand-Williams, “Accused ISIS supporter gets 5 years on firearm charges,” Detroit News, April 6, 2017, http://www.detroitnews.com/story/news/local/wayne-county/2017/04/06/accused-isis-supporter-sentenced/100135862/. Khalil Abu Rayyan“United States of America v. Khalil Abu Rayyan,” United States District Court for the Eastern District of Michigan, February 4, 2016, https://media.clickondetroit.com/document_dev/2016/02/05/SKM_C554e16020515520_2078266_ver1.0.pdf. @khalilaburay21“United States of America v. Khalil Abu Rayyan,” United States District Court for the Eastern District of Michigan, February 4, 2016, https://media.clickondetroit.com/document_dev/2016/02/05/SKM_C554e16020515520_2078266_ver1.0.pdf. @khalilray21“United States of America v. Khalil Abu Rayyan,” United States District Court for the Eastern District of Michigan, February 4, 2016, https://media.clickondetroit.com/document_dev/2016/02/05/SKM_C554e16020515520_2078266_ver1.0.pdf. Khalil Abu-Rayyan is an American citizen who expressed support for ISIS and a desire to carry out a domestic terror attack on a church in Detroit. “I would gladly behead people if I needed to…It is my dream to behead someone…”“United States of America v. Khalil Abu Rayyan,” United States District Court for the Eastern District of Michigan, February 4, 2016, https://media.clickondetroit.com/document_dev/2016/02/05/SKM_C554e16020515520_2078266_ver1.0.pdf. “I would have killed every last one of them…women and children…I would have shown no mercy…It would have been a bloodbath.”Ed White, The Associated Press, “Khalil Abu Rayyan, Michigan Convict, Said He Wanted To Skin Victims ‘Like Sheep,’” Huffington Post, April 7, 2017, http://www.huffingtonpost.ca/2017/04/07/khalil-abu-rayyan_n_15861684.html. “I regret not [attacking a church]. If I can’t go do jihad at the Middle East, I would do my jihad over here.”“United States of America v. Khalil Abu Rayyan,” United States District Court for the Eastern District of Michigan, February 4, 2016, https://media.clickondetroit.com/document_dev/2016/02/05/SKM_C554e16020515520_2078266_ver1.0.pdf. “I tried to shoot up a church one day…Ya, I had it planned out. I bought a bunch of bullets.”“United States of America v. Khalil Abu Rayyan,” United States District Court for the Eastern District of Michigan, February 4, 2016, https://media.clickondetroit.com/document_dev/2016/02/05/SKM_C554e16020515520_2078266_ver1.0.pdf.